Here are the main sources that I have used to gather the information for this site about Rome (apart from my own knowledge about rome). I apologize for any factual errors on this site, and are grateful for corrections! A book by Leonardo B. Dal Maso with very interesting historical facts. Tourist guide in English published by the Discovery channel that gives a good overview of everything in Rome. Excellent swedish reference where you can find almost everything you want to know about Rome. Very good knowledge resource (though perhaps not always so trustworthy). 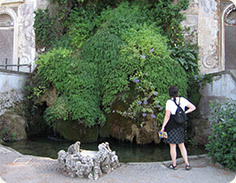 There are many fine articles about Rome even if not everyone of them is complete. The maps from Rome that I used are supplied by Google. To swedish newspapers have both contributed with inspiration and knowledge about Rome. All rights in images and texts in Romulus belongs to me, Mats Rigglöv, if no one else mentioned. It is okay to use my photos for non-commercial use if my name and www. rome.romulus.nu is visible. For other images that others contributed contact them for more information. If you wish to use images for commercial purposes please contact me. Most of the pictures in resolution 2592x 1944 pixels in original. 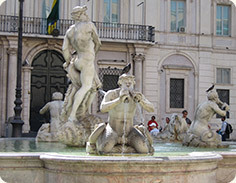 A fountain, located in the Piazza Navona. The picture was taken at the Roman Forum. In my Rome Travel guide you will also find tips on restaurants in Rome , what temperature it is in Rome , and you can even learn to speak some Italian phrases!